Ustad Waseem Ahmed Khan is blessed with a rare combination of teaching skills, fine temperament and an exceptional voice. He is one of the finest musicians of his generation. He comes from a great lineage of musicians of the Agra Gharana. He took his initial taalim from his maternal grandfather, Ustad Ata Hussain Khan, and later from his father, Ustad Naseem Ahmed Khan. He was a Scholar of ITC SRA under erstwhile Guru Ustad Shafi Ahmed Khan, who was his grand uncle. Waseem has focused on giving taalim to students of all ages. He is passionate about performing too. Having debutged at the age of 10, he has performed at various important concerts all over the country, singing at the ITC SRA Sangeet Sammelan at Delhi and the ITC SRA Guru-Sishya Parampara concert in Kolkata in 2003. In 2007, he toured France and Germany, one of his memorable performances being at the Theatre de-la-Ville in Paris. He also conducted workshops in Europe. A regular performer on All India Radio, he has been giving performances and conducting workshops all over the country via SPICMACAY since 1996. Dr. Vinay Mishra, an accomplished harmonium player, was born in Varanasi in a family of music lovers. While he has also learnt the sitar, the harmonium holds a special place in his heart. 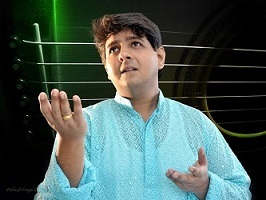 Vinay was born in the city of Varanasi in a family of music lovers. As a child, his father indulged his wish to learn classical music and decided to take him to Pandit Channulal Mishra for vocal lessons where he received his early training. Later on, he studied harmonium rigorously under the tutelage of Ustad Mehtab Khan and his father Ustad Chand Khan of Varanasi. Vinay also got a chance to learn the finer nuances of Indian classical harmonium playing from the legendary harmonium exponent Pt. AppaSaheb Jalgaonkar. Vinay also holds a Ph.D. in Music from University of Delhi and has a published a book called 'Harmonium - Vividh Ayam' which talks about the increasing importance of harmonium in today's classical music era. He has shared the stage with eminent artists such as Girija Devi, Ashwini Bhide, Pt Ulhas Kashalkar, Ud Rashid Khan, Pt. Venkatesh Kumar, Pts Rajan Sajan Mishra, Prabha Atre, Pt Ajay Pohankar, Pt Sanjeev Abhyankar, Shruti Shadolikar, Parveen Sultana, etc. for last 15 years in all the prestigious music festivals in India and has toured extensively over United States, Europe, Africa and Middle East. Pandit Ashis Sengupta is a versatile percussionist of the Banaras gharana. He received his initial training from his father Shri Ranjit Kumar Sengupta and was later groomed by Pandit Nanku Maharaj, Pandit Mahapurush Mishra and Pandit Krishna Kumar Ganguly. Pt. Sengupta has innovated to the various rhythmic compositions learnt from his Gurus and is also blessed with a lot of traditional compositions, Stotras and varieties of Gats from the great Gurus. Both as a soloist and an accompanist to widely varied music styles and performers, he is also an established western drummer to his credit. 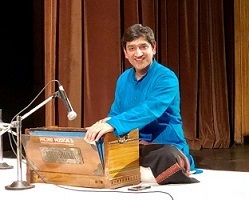 Apart from playing Tabla, he has composed Bhajans and music arrangements for light music compositions recorded by many reputed audio-video companies. Apart from his extensive global tour, he has participated India festival in Moscow, Germany, France, Holland UK, USA and Canada. He has accompanied some of the very distinguished Hindustani musicians of today as well as of the past like Pt. Nivrutti Bua Sarnaik, Pt. Mallikarjun Mansoor, Smt. Gangubai Hangal, Smt. Sunanda Pattanayak, Pandit Manilal Nag, Vidushi. Girija Devi, Pt. L. K. Pandit, Pandit Rajan and Sajan Misra, Vidushi Arti Anklekar, Pt. Gokulotsav Maharaj, Ud Rashid Khan, Pt. V. G. Jog, Pt. Vinayak Torvi, Pt. Ronu Majumder, Pt. Vishwa Mohan Bhatt, Pt. Kaivalya Kumar, Pt. Venkatesh Kumar, Pt. Shantanu Bhattacharyya and Pt Jayateerth Mevundi to name a few. Most recently, he has written a book on Tabla named "Facets of Tabla Playing", published by Kanishka Publishers, New Delhi. 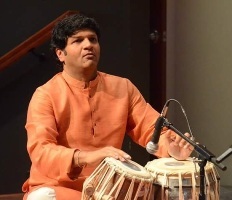 He has traveled extensively all over the globe for his performances and lecture-demonstration on Tabla playing under the aegis of numerous organizations. At present he is a member of the Faculty of Music and Fine Arts, University of Delhi. 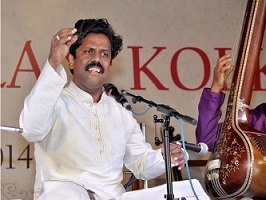 Omkar Dadarkar hails from a family of ‘Marathi Natyasangeet’ exponents. He received his initial guidance from his aunt, the late noted classical vocalist Manik Verma and thereafter from Ram Deshpande. After being awarded the CCRT scholarship (Delhi) for classical music, he was groomed by Pandit Yashwantbua Joshi under the scheme of Guru-Shishya-Parampara of the Dadar-Matunga Cultural Centre. A Sangeet Visharad and Bachelor of Arts in Marathi Literature and History, Omkar joined ITC-SRA as a scholar in July 1999, receiving rigorous talim under Pandit Ulhas Kashalkar. He completed his training in June 2005 with an A+ grade. He also trained in the light classical form under Vidushi Girija Devi and Srinivas Khale. His numerous awards include the prestigious Ustad Bismillah Khan Yuva Puraskar for 2010 conferred by the Sangeet Natak Akademi to talented artistes below the age of 35, the Aditya Vikram Birla Puraskar in 2009, the “Shanmukhananda Hall-Mumbai-Sangeet Shiromani” award and he is also the first recipient of “Chaturanga Sangeet Shishyavrutti Award” given by Chaturanga Pratishthan in collaboration with Mhaiskar Foundation, Mumbai. Omkar who was previously working with Mumbai Educational Trust, as Music In-charge returned to ITC SRA as a Musician Tutor in 2010 and has been promoted to the position of Guru of the Academy in 2017. Milind Kulkarni's natural flair for Harmonium reflects the eternal essence of Hindustani Classical Music as handed down in the true “Guru Shishya Parampara”. Milind took his initial training from Pandit Vsantrao Gurav and later on he has been taking the lessons from Pt. Pramod Marathe from Gandharva Mahavidyalaya. Milind earned his Bachelor’s Degree in Music, specializing in Harmonium at Centre for Performing Arts, Pune University, Pune. He has accompanied many prominent vocalist, instrumentalist and Kathak Dance performers. Milind is a regular performer of All India Radio & Doordarshan (T.V.) network. 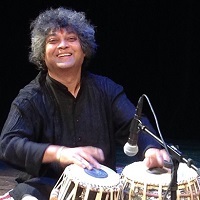 Sanjay Deshpande is a talented Tabla Player based in Pune, India. He was born in a music loving family and was introduced to the art of playing Tabla under Late Pt. Sabade at Pune Bharat Gayan Samaj. Later he took Taleem (lessons) from the renowned Tabla player Pt. Suresh Talwalkar of Delhi-Farookabad Gharana, in a Guru Shishya Parampara for 6 years. He also had the privilege of understanding the beauty of Punjab Gharana under the guidance of world renowned Tabla maestro Ustad. Alla Rakha Khan Saheb. At present he is taking guidance from Shri. Yogesh Samsi and Pt. Vivek Joshi. Sanjay is recipient of the coveted "Ahmedjaan Thirakwaa Scholarship" for Solo Performance. He has accompanied renowned artists like Smt. Vasundhara Komkali, Pt. Ulhas Kashalkar, Pt. Smt. Malini Rajurkar, Pt. Jasraj, Dr. Prabha Atre, Pt. Dinkar Kaikini, Dr. Ashwini Bhide-Deshpande , Smt. Veena Sahastrabudhe and many others. He has performed in major conferences such as Sawai Gandharwa Music Festival Pune, Paluskar Smarak Conference, Shankarlal Samaroha in New Delhi, I.T.C. Sangeet Sammelan . Dowerlane Conference, Kolkata. Sanjay has performed abroad in countries like USA, UK, UAE, Canada, Australia, Switzerland, Russia, Holland, Qatar, Sri Lanka, South Korea etc. He has also participated in the "World Vocal Festival" in Sweden. He is empanelled as guru at the Lalit Kala Kendra, University of Pune. He has number of recordings released. His fusion album "Wind From Ayuta" with Korean musicians won the Best album award of the year - 2002 in South Korea.